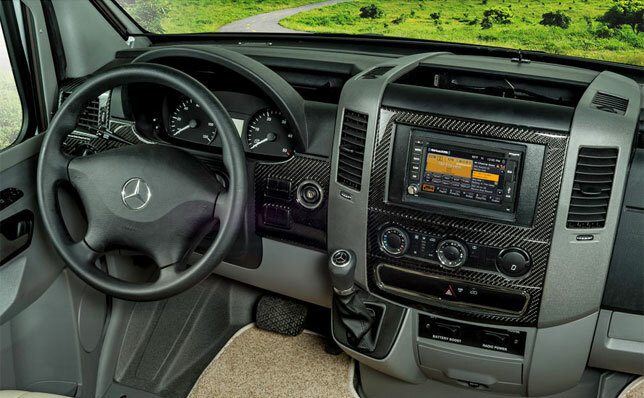 Powered by a Mercedes-Benz Sprinter chassis, there are 4 floor plans to choose from.Cab seats are adjustable, have arm rests, adjustable lumbar support and headrest. Power mirrors have a defroster and turn signals while the cab features a radio/rearview monitor system, equipped with a 6” touch screen color monitor, handheld remote, iPod/MP3 input and color rear camera. For an extra price, you can request an Infotainment Center with Rand McNally RV GPS, which comes with a 6” touch screen color monitor with a split screen function. 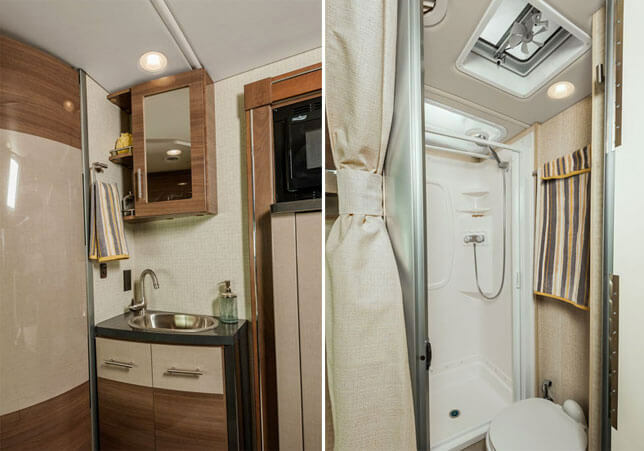 The bathroom has the necessary essentials: a porcelain toilet and a shower that has a retractable, self-cleaning shower screen and flexible shower head and a skylight. 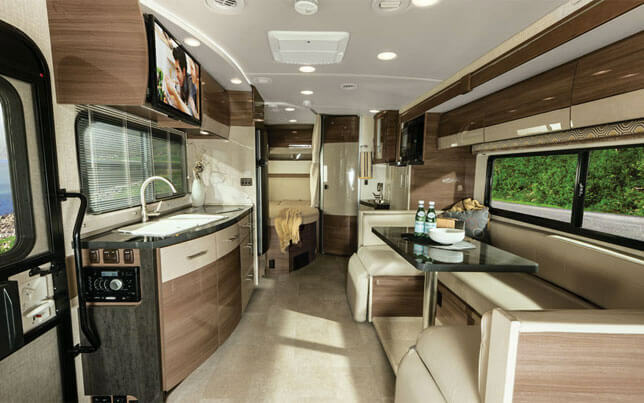 The Navion 24J is equipped with a versatile kitchen. Its amenities include a microwave/convection, two-burner range top with a flip-up gas cover, Norcold two-door refrigerator/freezer, and cold-water filtration system. For an extra price you can request an interior upgrade package, providing you with sink covers and a frosted acrylic galley backsplash with accent lighting. With an overhead compartment, pantry and drawers, there’s ample storage space for your dishes, perishables and whatever else you want to tuck away. 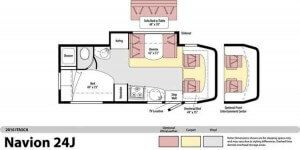 Facing the kitchen is the dinette with comfortable seating/sleeper. The interior features LED lighting throughout, reducing lighting energy consumption by up to 70%. If you’re traveling with more than two people, you can request an overhead bunk with a ladder and bunk privacy curtain. 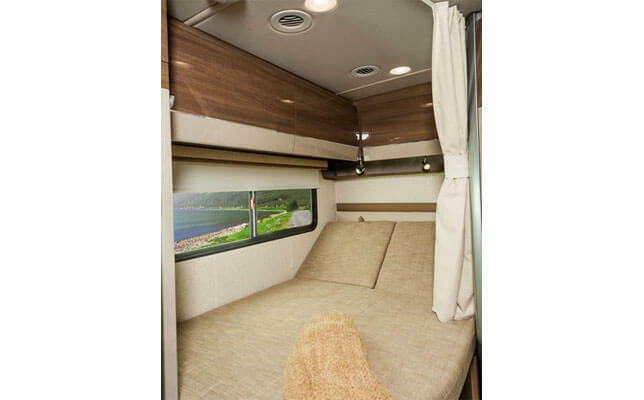 This motorhome entertainment includes an HDTV, coach stereo system, equipped with AM/FM radio, alarm clock, CD/DVD player, input jack, Bluetooth and two speakers with a subwoofer. The patio has a powered awning and LED porch light. The Navion provides shade while you listen to your favorite album through the exterior speaker system. When the day ends, the party doesn’t have to – just turn on your LED porch light and keep the party going. For convenience, there’s an exterior service center with color-coded labeling, making hooking up as easy as pushing a button.